Steel tycoon Lakshmi N Mittal may in future go for an initial public offering of the just-commissioned Guru Gobind Singh Refinery in Bathinda, where a low-cost expansion is planned to raise its annual capacity from nine million tonnes to 11.2 million tonnes. As for its cost, Sudhir Maheshwari, group management board member at ArcelorMittal, said it would be a fraction of the money invested in setting the nine-million-tonne facility. "At some stage, we will study the option of increasing it to 18 million tonnes," he added. Mittal, whose diversification into the energy space with state-run Oil and Natural Gas Corp has had a patchy record, wants to use his joint venture with Hindustan Petroleum Corp Ltd as the platform for growth in the oil sector. "HMEL (HPCL Mittal Energy Ltd) is a good platform to grow (in the energy space)," he said here. But Mittal's focus currently is to stabilise production at the Bathinda refinery that Prime Minister Manmohan Singh dedicated to the nation on Sunday. Once the refinery, which is built by HMEL -- an equal joint venture of HPCL and Mittal Energy Investment -- stabilises and starts making money, Mittal would think of the next steps. These include doubling the capacity to 18 million tonnes, foraying into oil and gas exploration and investing in raising complexity of the refinery to improve margins. "I am not ready for my guys to think loud before the refinery stabilises in a years time," he said, adding the next consideration would be a low-cost expansion of existing units to raise refining capacity to 11.2 million tonnes. Mittal had, in 2005, teamed up with ONGC for his big energy splash -- and formed two companies: one for exploration and production of oil and gas; the other for oil trading. But the joint ventures lost sheen because ONGC was not interested in trading business. Then, the 2008 economic downturn forced Mittal to restrict himself to his core business of steel making. "The partnership (with ONGC) is not over, but there are not many projects that the partnership is discussing," he said. Mittal, after the inauguration of the refinery, stated on Sunday that listing of HMEL was a desirable objective. "It should happen. But the timing is for the company board to decide. I'm not on the board of the company,"
HPCL-Mittal Energy Limited, a joint venture between state-owned HPCL and Mittal Energy Investment Pte Ltd, Singapore, an L N Mittal Group Company, built the Rs 21,500-crore (Rs 215-billion) Guru Govind Singh Refinery. The two hold a 49 per cent stake each in HMEL, while the remaining two per cent is with financial institutions. 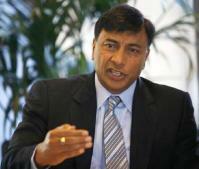 Mittal said a publically listed companies were a more desirable model. The two promoters may sell 10 per cent stake each in the IPO that may not happen before next year. He said the Guru Gobind Singh Refinery at Bathinda had land to double the unit's capacity to 18 million tonnes in future. Also, the 1,017-km cross-country 1,014-km pipeline that transports imported crude oil from Mundra in Gujarat, to the refinery, has a capacity to carry 18 million tonnes a year of crude. Mittal said his company was interested in working with HMEL on exploration and production of oil and gas. "With HMEL, we have set the stage." About investment, Sudhir Maheshwari said the promoters had invested Rs 8,000 crore (Rs 80 billion) as equity in the Rs 21,500-crore (Rs 215-billion) Bathinda refinery project, while the rest has come as debt. The refinery is configured to meet the demand of north India, which currently has a yearly demand of 40 million tonnes of petroleum products. Against this, supplies for units in north are only 25 million tonnes annually. Of its total produce, diesel would constitute 40 per cent, while gasoline or petrol would be about 10 per cent. LPG would be eight per cent and it will not produce any fuel oil. "Though we are not seeing the progress we would like in our steel projects, our committment to India is there as seen from investment in Guru Gobind Singh Refinery," Mittal said. The refinery, he said, was a "clear signal" that things can happen if state was set rights. On how he chose Bathinda refinery to invest, Mittal recalled that there was a lot of discussions on possible opportunities in 2004-05 when he decided to partcipate in India's energy security. The Bathinda project was one where previous prime ministers had laid foundation stones, but not much progress had been made, he said. "HPCL had already acquired land for the project. So, I thought it was a good investment to make," he added.